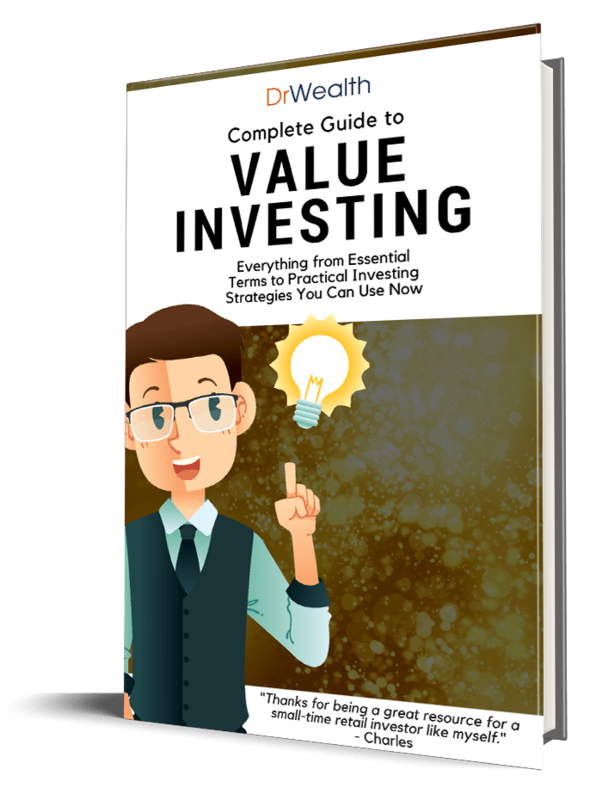 We know there will be naysayers when we began running our Value Investing course and pitching a different approach from Warren Buffett. “Well, it all sound good in theory, but does it really work?” We know we have to show results. Real results, not just a paper account. We started the CNAV Portfolio in 23 Aug 2013. It is about a year and it is timely to review the performance. 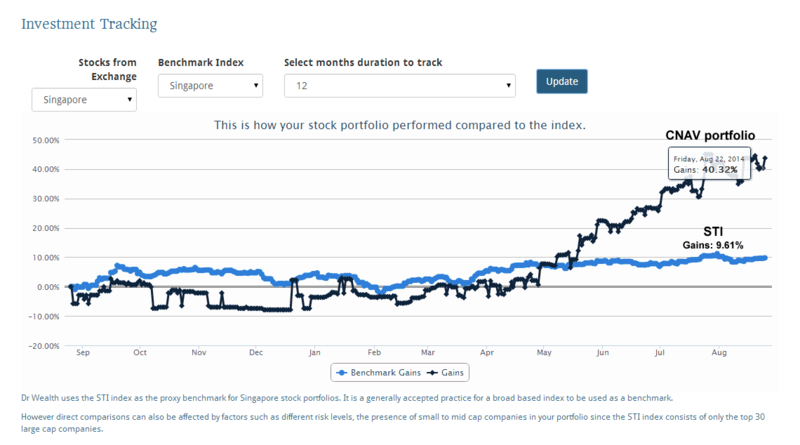 As the entire portfolio is in Singapore stocks, we will compare the performance to that of STI. If we cannot beat the index, what’s the point of picking stocks? Retail investors should always remember this criteria if they want to pick stocks. We use Dr Wealth’s platform to track the portfolio returns. It is quite simple to use and it plots the portfolio returns against STI. Below is the chart generated from Dr Wealth (click the image to enlarge). The one-year return of the CNAV Portfolio was 40.32%, which is slightly more than 4 times the returns of 9.61% for the STI. During this one year period, we took profit for one stock and added a couple more with the proceeds. The stock was PNE Industries. I shall use this example to illustrate how the CNAV strategy can help you make rational investment decisions, which you will normally find it uncomfortable. We bought PNE Ind at $0.88 on 28 Jan 14 when there was a CNAV discount of 25% and POF score was 3. Most people will not like this stock. This is not the Warren Buffett kind of stocks that people talk about. I have heard comments like electronics manufacturing is in the sun set industry. You have to wait very long for the assets to be unlocked. The family owns majority of the shares and they can take it private at the expense of the other shareholders. The stocks is so illiquid, it is not going to move. We often decide first then find reasons to support our decision. Most people would dismiss the stock as crap first, because they have never heard of it and find it so dis-familiar. If it is so good, why have they not heard of this stock before? To prevent cognitive dissonance, they had to find reasons to support why they should dismiss the stock. I have written about how we can be so bias even for the name itself. You can refer to this article. For us, we do not have the preference for or against the stock. We are objective and we will take action as long as the numbers are attractive enough. Little did most investors know that the amount of dividends they gave can be better than most of the blue chips. Our dividend yield for PNE Ind was 10.2%. If we include the special dividend, our dividend yield will increase to 33%! But we don’t invest for yields. Yields are bonuses to us as we focus on buying assets at wonderful prices and sell them at valuation to reap capital gains in the process. The chart below shows the entry at $0.088, below the CNAV of $0.11, as well as the exit at $0.225, above the NAV of $0.21. This stock was sold on 14 Aug 14 and we no longer have any position in it. The CNAV Portfolio has done well in the past one year but we know that the long term results (5 years or more) is more important and a true reflection of skill. Hence, we will continue to track this portfolio and show you the results. If you are interested to learn how to value a stock using CNAV, I urge you to attend the course. Lastly, I would expect you to be a matured adult and not treat any information in this article or website as a recommendation to trade or invest. We are educators. We use examples to educate. We are not your financial advisors. I read in your site that CNAV means Conservative Net Asset Value. But what does POF mean? Thanks. That’s some impressive returns. 40%! You are doing well with your investments! We do not know what the future might bring and the returns may potentially come down? We do not know the mean returns yet.